The amount you have to move, where it resides at present, and where you want to put it as you move it into Office 365, can also shape your migration strategy. Apologies in advance, as this has turned into a longer article than we originally intended - but it's a big subject! The first thing you'll probably want to do is pinpoint larger mailboxes. Apart from taking a long time to get moved across, if you have any mailboxes that exceed 50 GB you will need to make them smaller prior to your move. Suggesting that users start deleting (or centrally enforcing deletions) to get back under 50GBs is an approach that just won't wash these days...so what are the options? Horenbeeck to help you estimate the impact of a given set of Exchange retention policies on mailbox sizes - e.g. Items over a certain Age Limit. See the bottom of this article for tools to help with generating these reports. You can now migrate messages up to 150MB in size to Office 365, but this means you still need to weed out those odd few messages that are bigger than this prior to migration (otherwise they won't migrate) and establish your game plan for moving them. Is Microsoft's On-line Archive Really Unlimited? Our recent experience indicates that, although Microsoft says In-Place Archive sizes are effectively unlimited, a 100GB limit is automatically applied. This can be lifted to 170GB on request (at the time of writing this article), however once you hit this limit, Microsoft is currently providing an additional mailbox to handle the extra data (this may change in the future). This 'extra mailbox' approach could be of concern with respect to future management and access to this data. It may also have ramifications when it comes to eDiscovery, as in both cases you will need to know there is a secondary mailbox that needs to be taken into consideration. Having a profile of your overall mailbox and archive sizes will help you establish a throughput baseline, build appropriately-sized mailbox batches, and help gauge how long your migration to Office 365 will take 'end-to-end'. If you're migrating in a hybrid environment, the usual 'modus operandi' is to schedule MRS (or other migration tool you might be using) to run outside of core office hours so you can push through as many mailboxes as possible - as quickly as possible - without incurring the wrath of end users. Even more critical, if you're migrating using a cutover or staged approach, you'll want to work out if you can meet desired timelines (e.g. over a Bank Holiday weekend). Watch out though - it can be slower during out-of-hours and the weekend, because your are not the only one to have the idea to schedule big moves during these times :-). If you trawl the Internet you'll get a whole bunch of different Office 365 ingestion rates ranging from 1GB per hour to over a TB a day. Our best advice is to carry out test migrations in your own environment - with a reasonably large data set - to work out the maximum number and size of mailboxes you can move in a given time-frame. The more mailboxes you can move in parallel the better, but simply cranking things up doesn't mean faster migrations as you'll find you hit a ceiling.. If you want a clearer view of performance that looks at your own network as well, remote probes can help you achieve this (see end of article). If you're migrating in a hybrid environment (and have purchased the relevant plan), you can take advantage of the fact you can provision hosted In-Place Archives ahead of moving primary mailboxes to the cloud. If you use native Exchange archiving, you'll need to check you have enough temporary space on your Exchange server to 'pre-stage' the archived emails. Customers that have taken this approach have been able to release the space on their Exchange servers for re-use as they move onto the next batch. NB Mailscape reports are available to help you check that white space and storage is maintained within acceptable operating limits. Michael Van Horenbeeck prefers to create on-premises archives first and then move them later using MRS. This is because of how Outlook interacts with the archive and the effect the initial 'seeding' of the archive has. His script (referred to earlier) will help you determine the amount of data that will need to pass through your internet connection which ever route you take. We've already spoken about using 3rd-party migration tools to move the contents of 3rd-party archives, but the concept of using tools to help moving primary Exchange mailboxes is a well-trodden path. The ability to populate online Primary mailboxes with say, the first 3 months' of emails (to get users on-boarded REALLY quickly) and then gradually 'backfill' the remaining email over time. 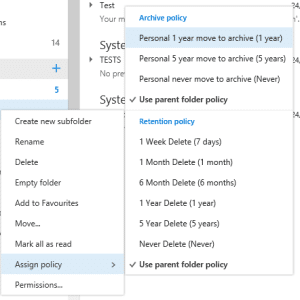 The ability to correctly handle any legacy archive shortcuts as they get encountered during the migration. 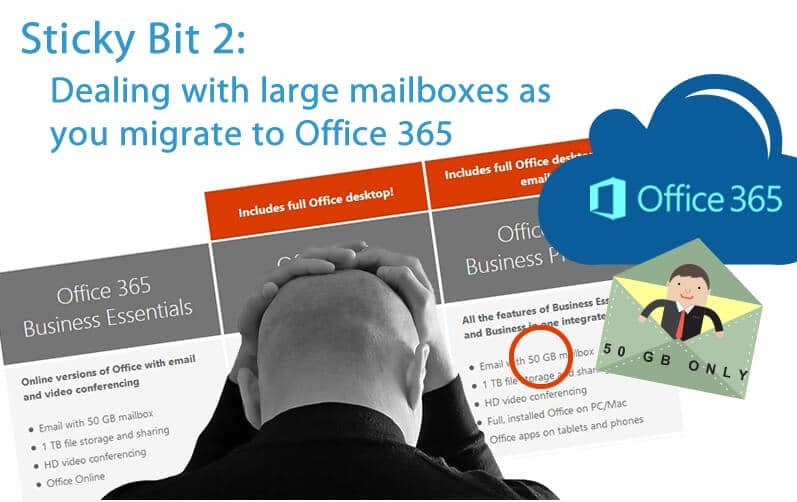 We recently encountered a widely-used 3rd-party solution that simply migrated shortcuts into Office 365 and actually 'broke' them in the process, making it impossible to identify and manage them 'post-migration'. *Generally speaking, an approach that uses the EWS protocol to talk to Office 365 (which many 3rd-party migration tools use) as opposed to MAPI (which MRS uses) is faster. This is largely owing to the fact that the ability to use impersonation enables you to move more mailboxes concurrently. If you're migrating items that are currently stored in a 3rd-party archive, bear in mind that you'll have an expansion factor. Contact Essential if you'd like assistance in estimating what your archived data might equate to as you migrate to Office 365. Even though primary mailbox sizes in Office 365 are generous, if you plan to use ‘full Outlook’ (desktop) clients with the ability to access emails when working offline (i.e. using OST files), you could encounter problems. This is because having overly large online mailboxes to synchronise onto local systems will create a huge network overhead during the migration process. If you use Outlook client 2013 or above there’s a slider to control how much gets synchronised, but older versions of Outlook may struggle to provide a performant synchronisation service and could literally kill your network as mailboxes get switched over to Office 365. Depending on your overall migration strategy (e.g. cut-over, staged, hybrid) and what you have to migrate, which could include large mailboxes, archives, public folders, leavers' mailboxes and journal mailboxes (these are a whole different subject which we'll cover in later articles), your migration could be managed in a number of different ways to mitigate risk and ensure minimal downtime for end users. There's no 'one size fits all'. Essential has supported customer migrations that have used a variety of techniques to meet technical and business needs. We are also flexible in our approach, and happy to help your own IT team oversee the migration, or work alongside a chosen on-boarding partner to address the trickier bits, like migrating 3rd-party archives and distributed PSTs. Call today to talk about your plans and concerns and what we can do to help. Although you can get the profiling and performance monitoring information you need to help with your migration - it can involve some considerable time and effort. Has a number of Remote probes that will give you real time updates on actual performance and latency as you run your migration. PS - You can get Mailscape for free for 30-days - which is very useful during a migration if you time it right! It's also available as a low cost 'pay as you go' licence to support your migration and a 'bedding-in' period.